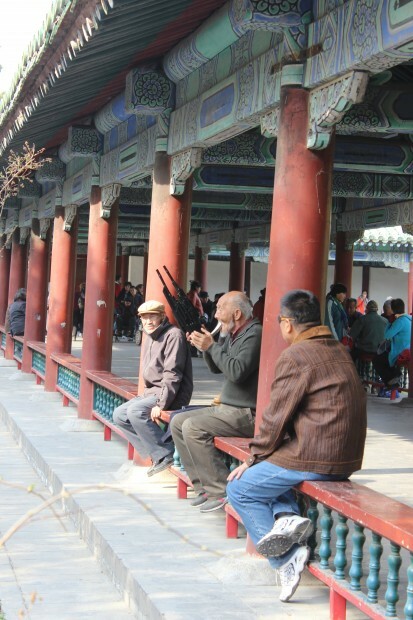 China’s capital Beijing has more than 20 million inhabitants and a more than 3000-year-old history. Its name means Northern Capital. 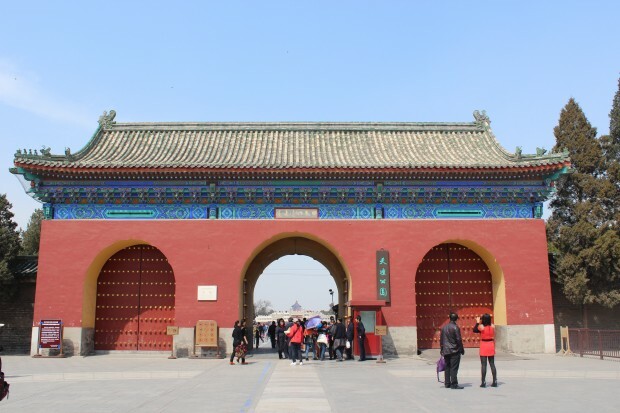 With the Tiananmen Square, the Forbidden City, the former Imperial Palace which is a UNESCO World Heritage Site since 1987, the old and the new Summer Palace, the Temple of Heaven, the Lama Temple, the Confucius Temple et cetera it hosts an imposing cultural heritage. After breakfast I have digested last night’s adventurous hitch hike with the two chinese guys and I am feeling ready to explore the cultural sites of the city. 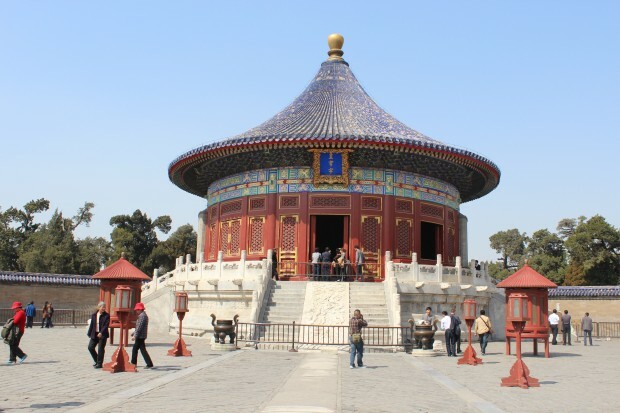 For today I have planned a visit of the Temple of Heaven which is named Tiantán in chinese. At the reception I am told that it is very easy to find. The best way to get there is to walk and that it only takes about 20 minutes to get there. Since I read that it takes 30 to 35 minutes to walk, I am a bit skeptical about actual distances so I decide to take a taxi today. It comes out that the receptionist was right and that it is indeed very close. The drive takes about five to ten minutes and I only have to pay ten Yuan for the taxi which is the starting price for a taxi ride and which one also has to pay if the taxi would only drive three metres. The poor taxi driver, with me he doesn’t really do big business today. 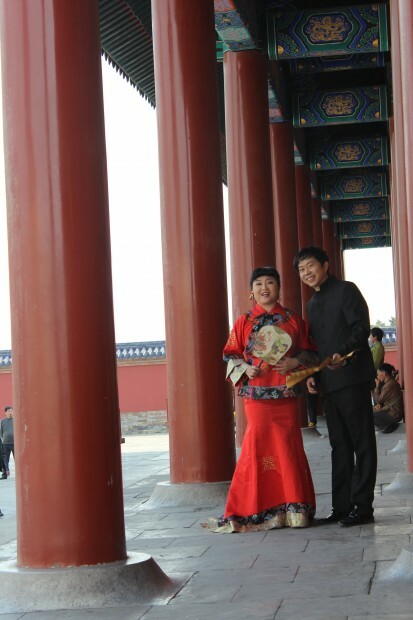 He drops me off in front of the South Gate which is also called Zhaoheng Gate so that I can walk the recommended traditional ceremony route. 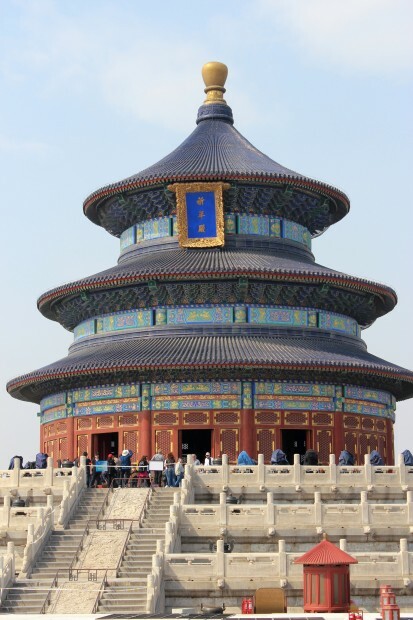 The Temple of Heaven is a temple complex where the emperors of the Ming and the Qing dynasty prayed for a good harvest year by year. 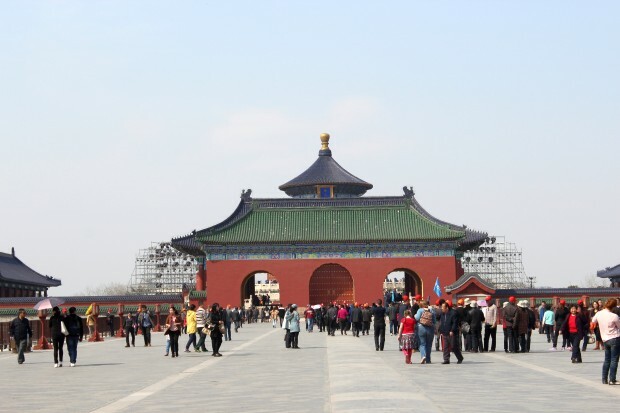 For five centuries it was the center of imperial ceremonies and symbolism. 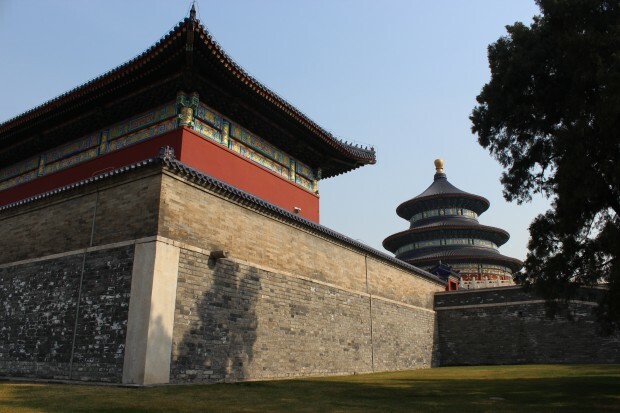 Its construction started in 1406 during the regency of Emperor Yongle and was finished in the year 1420. The temple was the most important boundary point of Heaven and Earth and symbols of both are visible in the compendium. For the chinese population it was forbidden to even take a look at the big yearly procession to the Temple. The complex is located in the South of Beijing inmidst a huge park which is 1200 metres long and surrounded by a double wall and old trees. So it is the longest complex for heaven worship worldwide. In the northern part the walls have a round compendium while they are quadrangular in the southern part of the complex. 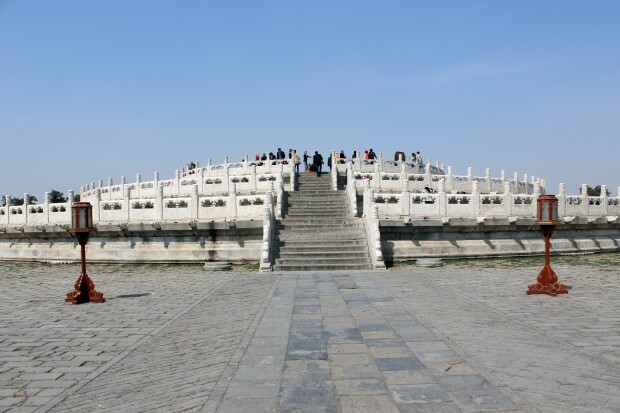 After entering the complex through the Zhaoheng Gate I walk straightly onto the Circular Mound Altar which consists of three marble terraces, one upon the other. They stand for humanity, earth and the one on top for heaven. The topmost terrace is empty today, in former times there was the throne of heaven in the middle. It symbolized the center of the Middle Kingdom, even the center of the whole world. I spend some time on the Circular Mound Altar and take photos, but try to avoid to get too many tourists on my photographs which is a challenge as there are literally a hundred others of them. A dutch family asks me if I could take a picture of them what I, of course, do. In return they take a few photos of me. I continue onto the Imperial Vault of Heaven which is completely built of wood. It is surrounded by the Echo Wall, an exact circular wall, which is supposed to be the perfect Whispering Gallery. Due to the mass of tourists and the accompanying soundscape it is impossible to try that. 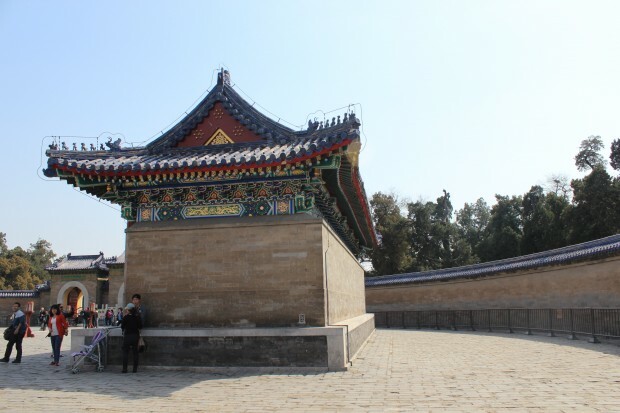 I am crossing the Chengzhen Gate and walk over the 360-metres-long Danbi Bridge onto the Hall of Prayer for Good Harvests which applies to be the most imposing building and the highlight of the whole complex. 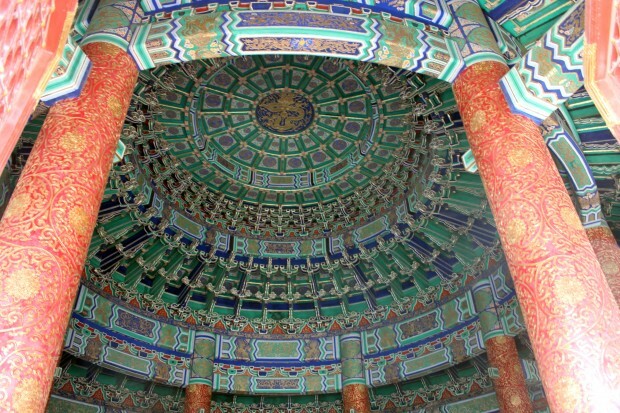 Like the Imperial Vault of Heaven it is completely built of wood without using one single nail. 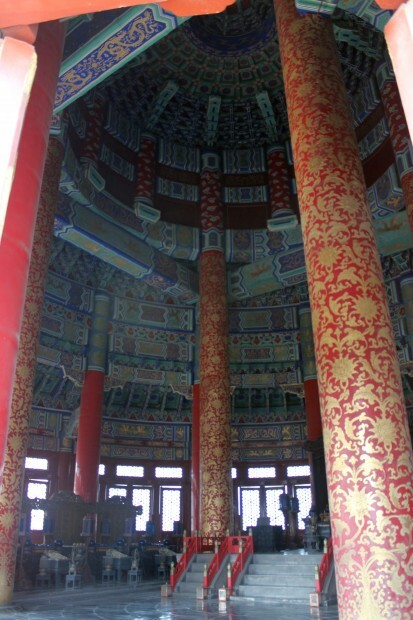 The central four pillars show into the four cardinal directions and carry the building. In 1889 the temple was completely destroyed through a flash of lightning and was rebuilt faithful to the plans of the Ming Dynasty. 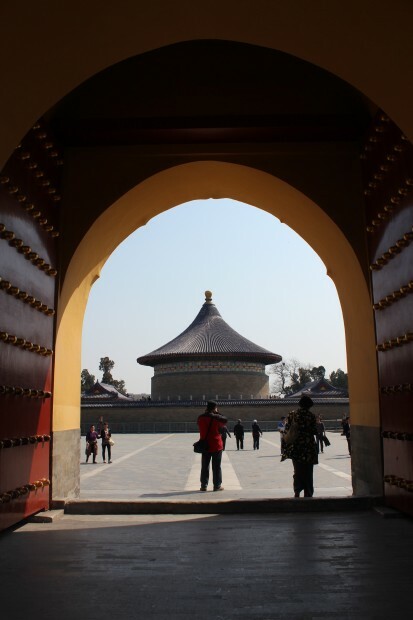 I exit the inner temple complex through the North Heaven Gate and walk through the Temple of Heaven park between the inner and the outer walls of the complex. I reenter the inner temple complex through the eastern entrance. In the long corridor east of the Hall of Prayer for Good Harvests are chinese locals sitting, talking to each other, playing games and making music. Still inside the Temple of Heaven Park I find a small local restaurant where I have a very late lunch. I am the only westerner in this place but at the outside terrace is a big group of chinese people sitting and enjoying their meals. The food isn’t great but ok. When having finished I am walking back to my hotel which takes me about 25 minutes. The way is effectively easy to find. After being back at my hotel I spend some time at the hotel swimming pool. In the evening I order a taxi to a place called “Beijing Bookworm” which is recommended by my travel guidebook. It is located in the Nan Sanlitun Road, in the embassies district. The drive there takes about half an hour but only costs me 35 Yuan. I am very much looking forward to try different types of local food but as a westerner who doesn’t speak chinese it is not that easy to just enter a local restaurant and order food, as in most places the menu is only in chinese and if one is lucky with pictures of the dishes. The staff mostly doesn’t speak English, so you never know what you get. My lunch today was also a bit different than expected, so I think till the start of my tour having local dishes once a day is enough. But I really hope that our local chinese tour leader will take us to local restaurants and introduce us to the local chinese cuisine. The “Beijing Bookworm” itself is really nice. The place has a Bistro-Bar area, a café and a restaurant which are in three different rooms. One really feels like being in a nice bookstore, there are bookshelfs full of books everywhere. The menu is western as are the prices but the food and drinks are really delicious, fresh and homemade. The other guests are half locals, half apparently western expats. I am spending quite some time there. Later in the evening I ask one guy of the staff if he could call me a taxi but he shakes his head and tells me that I should stop one on the main road. Awesome, that hasn’t worked out yesterday already! 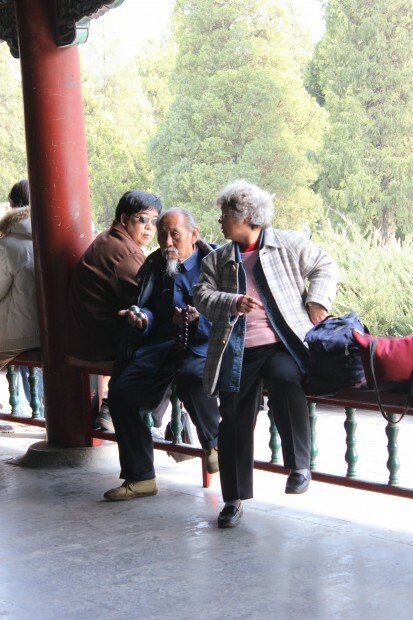 I am getting into conversation with two irish people, a man and a woman, who live in Beijing. They state that it is common to stop taxis on the street or grap one at the taxi stand but that it is more difficult to get one after 10 PM as all shops close at that time and everyone wants to get home then. At the taxi rank I try to organize myself a taxi but two taxi drivers want me to pay 80 Yuan. Two others agree to go by meter but tell me that it wouldn’t cost less than 120 Yuan as it is a long way to go. I am already sitting in one of them but get out again as I fear that the taxi driver might manipulate the meter. 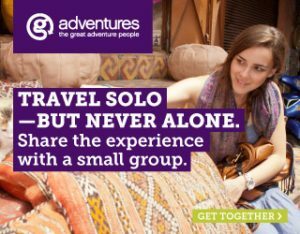 That has happened to me in Hanoi, Vietnam, a few times. I decide to take the metro. On the main road I ask two young chinese females for the way to the next metro station. One of them speaks effectively good English and is extremly friendly and helpful. She thinks that she knows my hotel but she is talking about the other hotel of the same chain. She telephones to find out which is the best way to get to my hotel. Then she says that they would now take me to the next metro station by taxi as it is on their way home anyway. On a sheet of paper she writes me down in english and in chinese where I need to change lines, how many stations it is till there, the number of the metro line I need to take then plus the terminal stop where I need to get off to walk back to my hotel. In addition she notes down her telephone number and says that I should call her if I get lost tonight or in the next days till I meet my group. I want to pay for the taxi but neither she nor her friend don’t want to take my money. The Beijing metro is great, clean, structured and efficient. The only disadvantage is that at around 11 PM the last trains run so that one has to make sure to get on the trains on time. In the first train I meet a german married couple. 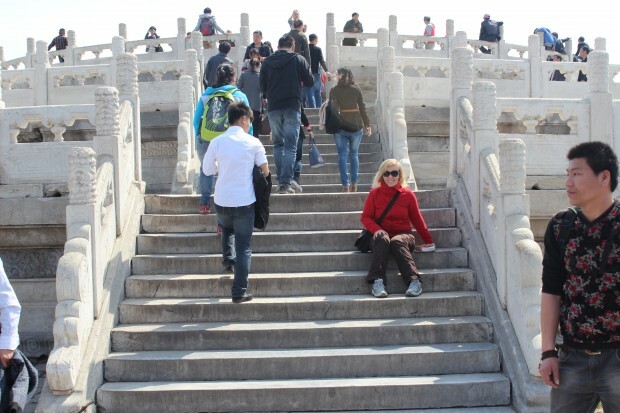 She has been to China a few times at the end of the 1980s and says that it has changed a lot since then. Currently they are in China for business reasons. Changing trains also turns out to be very easy. At my terminal station I ask a chinese couple which exit I have to take. Those two are as well very friendly and helpful. At the street I show my hotel business card to a chinese woman and ask her for the way. She doesn’t speak English but points onto a vehicle which is apparently China’s reponse to Thailand’s tuk tuks. The driver doesn’t speak English as well but I understand that he wants to have five Yuan for the drive and get into the vehicle. After driving a few metres he stops and starts to gesticulate. When I signal incomprehension he shows me a 20 Yuan bill and a two Yuan bill. I get off the vehicle. He takes out a ten Yuan bill of his pocket but I still don’t agree but show him a five Yuan bill. He finally agrees. I had hoped that he would drive the direct way to my hotel so that I can remember it for tomorrow but he makes several turns before he stops in front of the hotel entrance. So tomorrow I will have to ask for the way again. I don’t get sponsored by the “Beijing Bookworm”. I had to pay for my food and drinks like everyone else. 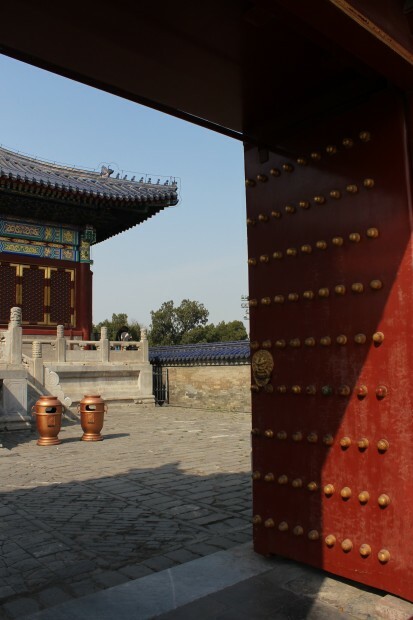 I wrote quite detailed about it as I really like the place and think it’s a good place for a westerner who doesn’t speak chinese and explores Beijing on her/his own.